They all have one thing in common – achieving success despite numerous life challenges. Famous people who share their success often credit it to simple things. Like sleep, for example. It’s important to everyone. The difference between a “good night’s sleep” and a lousy one can make or break your day. Experts say the very last thing you do before bed affects your mood and energy level the following day, since it often determines how well and how much you sleep. I hated sleeping when I was young – up until my early teens. Then it suddenly became a precious commodity after long nights of partying. Sleep took on even more significance when I was sent to Vietnam in 1970. I learned to sleep in every imaginable position. Even standing – leaning against something. If I got a total of six hours sleep in a 24 hour period I considered myself a lucky dogface. Having said all this, I now consider myself a slouch. No apologies. Thanks to daily naps and a early bedtime I get a lots of sleep. I have no interesting pre-sleep rituals to share with you. That is, unless you cou nt drifting off and taking your brain out of gear. In my “non-system” no coherent thoughts are allowed to trouble my brain. Successful people however, look at sleep as a necessary function that one must prepare for each night. In his autobiography, Benjamin Franklin outlined a schedule that would lead him to "moral perfection." In this ideal schedule, Franklin asked himself the same self-improvement question every night: "What good have I done today?" Franklin tracked his progress on self-improvement daily. Now that’s dedicated. 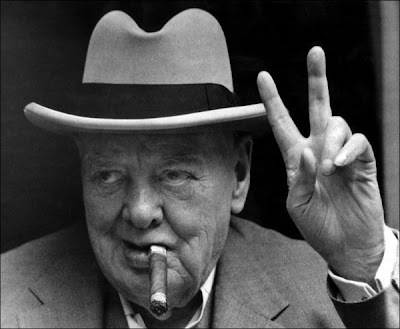 At 8 p.m., Churchill would eat dinner, which was often followed by drinks and cigars well past midnight. Due to his irregular sleep schedule, Churchill was said to hold War Cabinet meetings in his bath. That couldn’t have been a pretty picture, but anything went during wartime I suppose. One of my favorite authors, Stephen King, has a nightly routine that includes washing his hands and making sure all the pillows face a certain way. "It’s not any different than a bedtime routine," says King as recorded in Lisa Rogak's book "Haunted Heart: The Life and Times of Stephen King." "I brush my teeth, I wash my hands. Why would anybody wash their hands before they go to bed? I don’t know. And the pillows are supposed to be pointed a certain way. The open side of the pillowcase is supposed to be pointed in toward the other side of the bed. I don’t know why." The Microsoft billionaire told the Seattle Times: "I read an hour almost every night. It's part of falling asleep." He enjoys "deeply informative and beautifully written" books (in June he released a list of six books he recommends) and his reading topics range from healthcare to climate change to business and politics. In conclusion, some of us are slouches who still manage to get by and actually have a successful, but unspectacular, career. Slouches, like myself, are seldom famous. But they’re always well-rested!